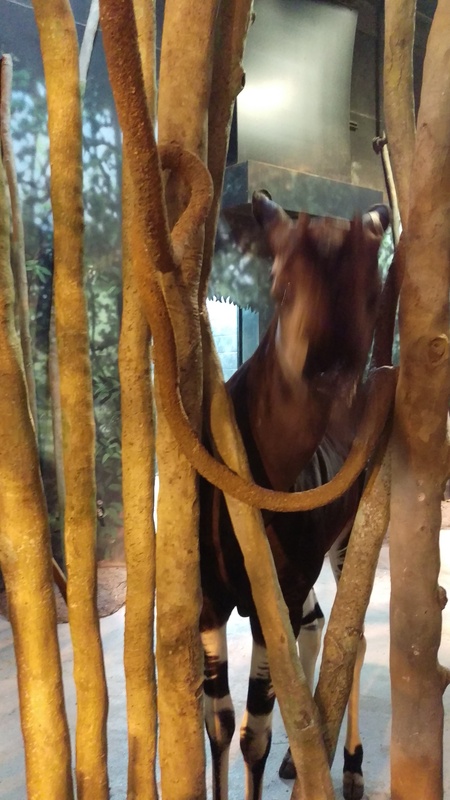 This shy fellow is a forest-dwelling creature called an okapi. From central Africa, they resemble a zebra crossed with a giraffe and are about the size of a tall but skinny horse. They also have long, skinny black tongues. I’m disappointed because I can’t find the series of photographs I took of the mother with a newborn, nor the ones of a single okapi over in the holding area in the back corner of the zoo. However, on this particular day when we visited, I had my cell phone camera with me. 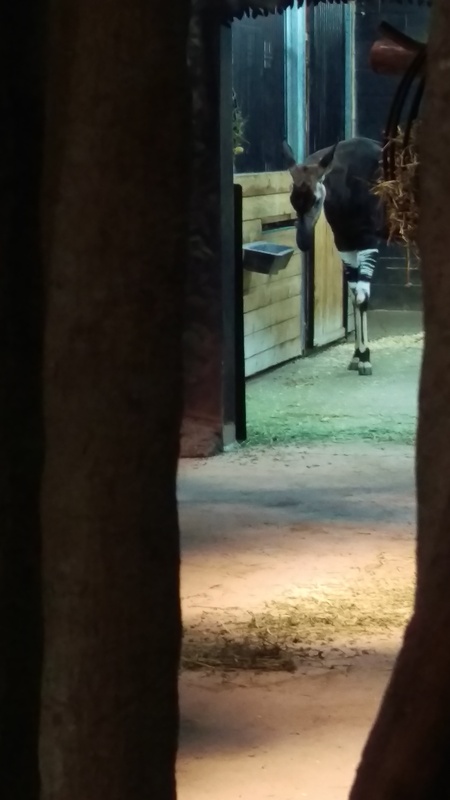 When we came into the building where the okapi live, there was a volunteer zookeeper there doing some research. 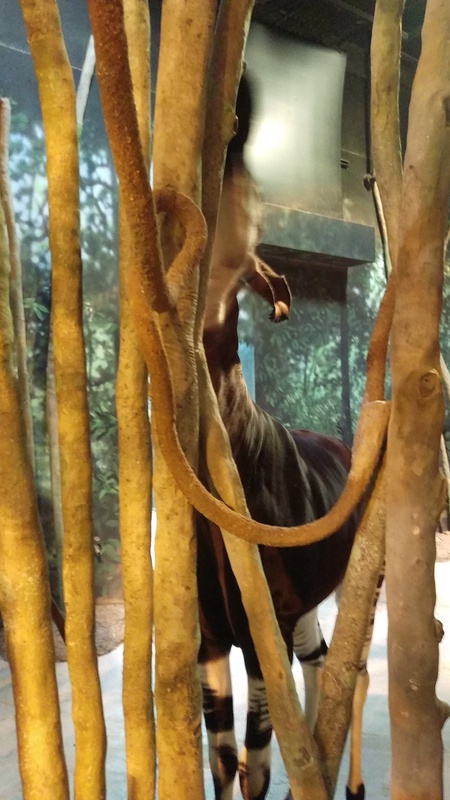 She told us that this okapi had been orphaned and was hand-raised by the zoo. He will not be able to go back into the wild. 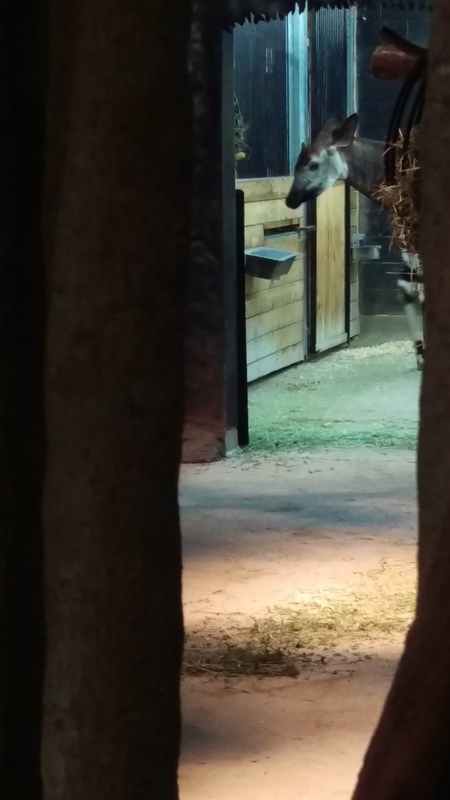 I turned back to find that the okapi isn’t just shy, but also curious. Unfortunately, I jiggled my camera when I tried to be sneaky about bringing it up to snap his photo. He moved his head when I took the shot, so he’s blurry, but you can see his striped legs. Skinny little legs, aren’t they? Squirmy little bugger, too. 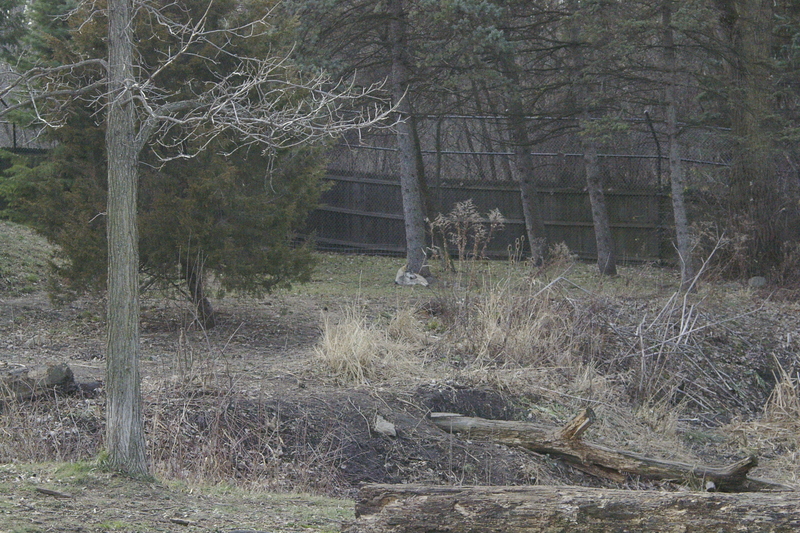 He reached up to see what was up above in the enclosure, so all I got was his ear. Phooey. He decided to wander back inside, and I got this picture of his back and ears in the light. He has a lovely coat, like a bay horse but with giant satellite ears. My big camera, the SLR, (Single Lens Reflex), couldn’t handle the lack of lighting. I used the camera in my phone, which has much better performance in low lighting, but even it had trouble focusing on the very dark corner. So we were, like, interrupting. 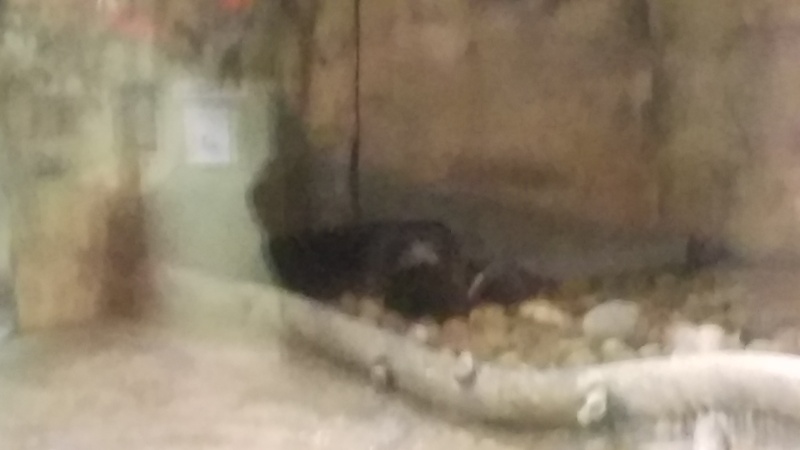 As I stood there, trying desperately to take a decent picture of them, one of the otters got up and grumpily wandered over to its little den cave thingie to hide. 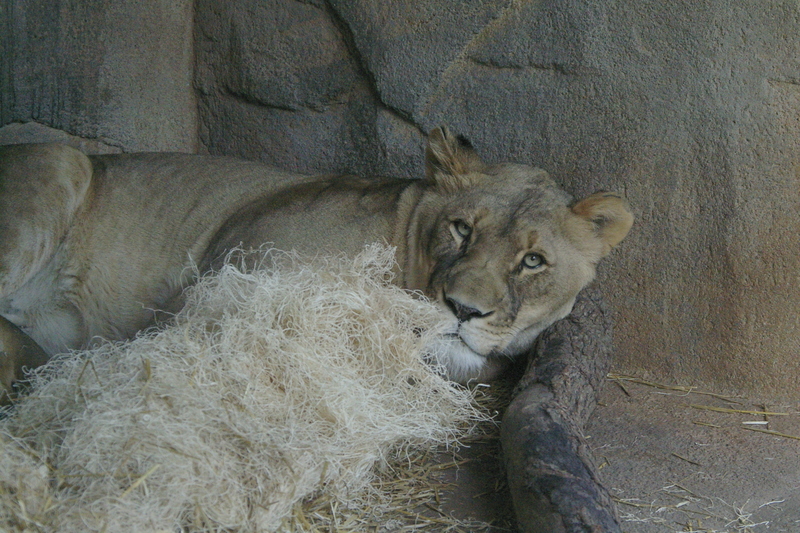 The other one, clearly wanting to nap, curled up with a smug sort of “And stay out” attitude. Hmm. There’s only one problem. What am I going to use for “N” today? I know! 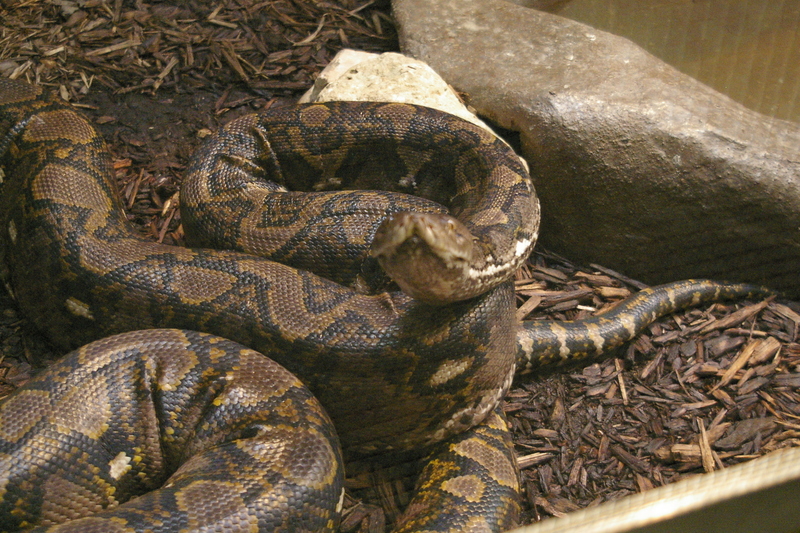 The Reticulated Python! It has an “N” in it, come on! Granted, it’s at the end, pythoN, but it’s still an N. Besides. There’s a story here. This isn’t even a fully grown snake. He’s fricken huge. A little background: my husband is what they call a “herper,” short for the word “herpetologist,” meaning someone who studies reptiles and amphibians. 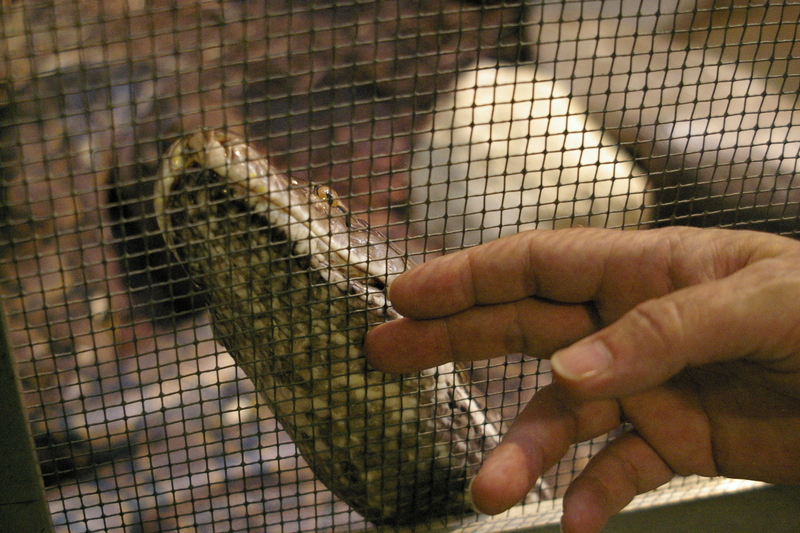 I’ve learned, though him, that the herper community is filled with highly knowledgeable people because if one decides to keep these animals as pets, there’s not a lot of information about them and so one must learn a lot about their care in order to do it properly. It’s a lot more complicated, therefore, than keeping, say, a puppy or a kitten. For those of you not familiar with our books, my coauthor Rachel and I have a series with snake shifters whose animal form is a Burmese python. 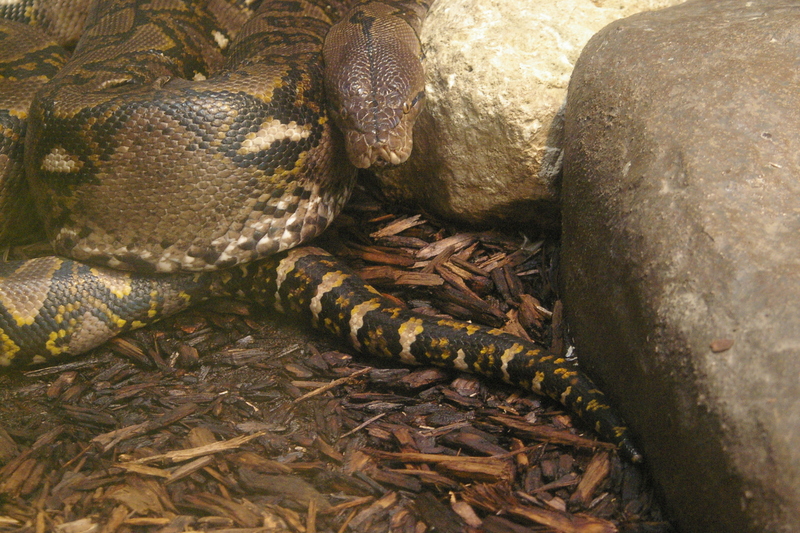 Burms are very popular in the pet trade because they can be socialized and are quite friendly if handled properly. They get very large, with the females growing to between sixteen and twenty feet. 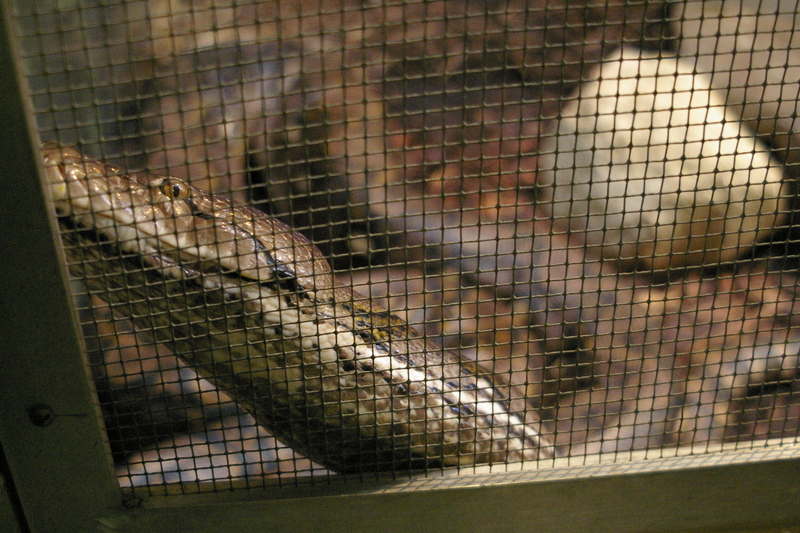 In these snakes, the females are larger then the males. 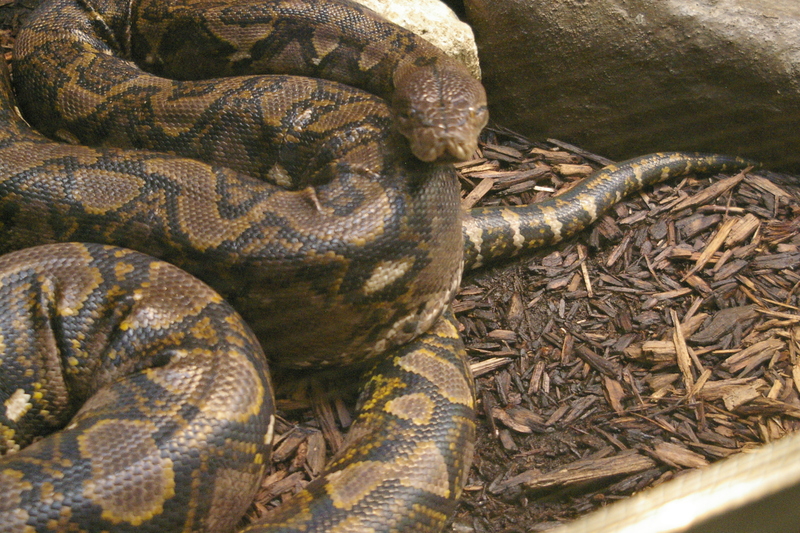 In the pet trade, as I understand it, reticulated pythons, pictured above, are responsible for the largest number of pet-related deaths every year. They are not friendly, and they are not socializable in the way that Burms are. 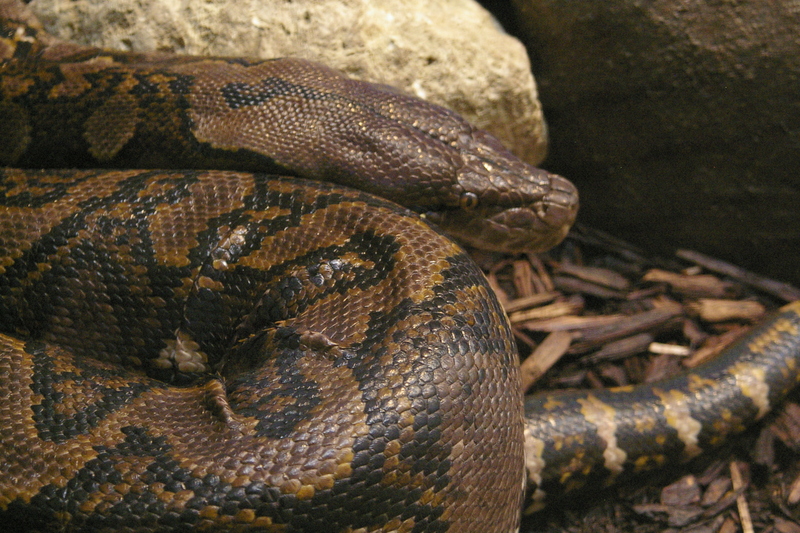 They trade off with the anaconda for the longest snake in the world. Their natural diet in the wild is baboons, among other things. And humans, you may have noticed, are awfully similar to baboons. Why someone would want a pet that looks as one as a potential food source, I don’t know, but there you go. I asked my husband how big they get, and he said that in theory, they don’t stop growing. Like that’s not seven kinds of creepy. Since I was doing shots for the challenge on this visit, I bent down to get a better angle. Out of reflex, I started talking to him. Apparently, he realized I was talking to him and started moving. My hands started to sweat at this point. I don’t mind snakes, as I said, but moving snakes are unpredictable, at least to me, and I don’t know what to do. Understand I’m in absolutely no danger here; there’s a very thick (3 inches or so) lucite barrier between me and him. 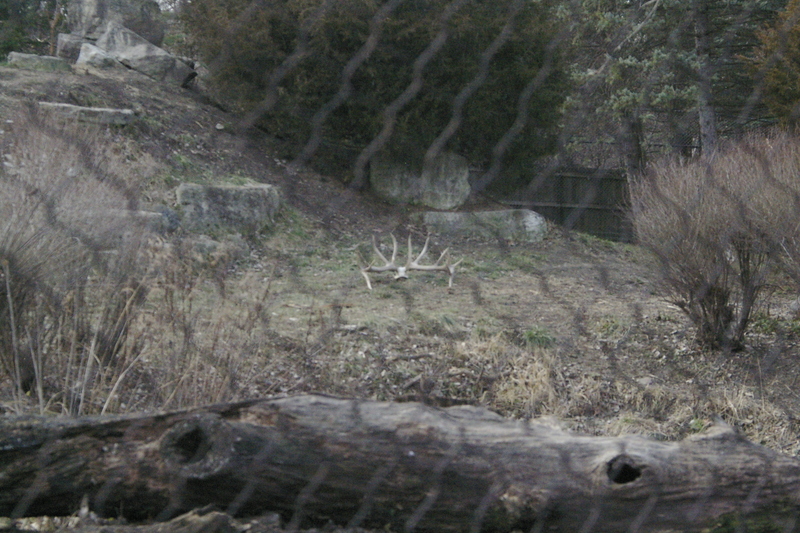 There is, however, a thick screen grate thing over on the left front of his enclosure. I started talking to him at this point, because clearly he’s looking at and responding to me in some way I don’t understand. He’s not a mammal; I don’t know how to read his body language. My husband was off looking at the Galapagos turtles and, to be honest, by this point I was totally engrossed in what this fellow was doing. I swear, I did not hear it. 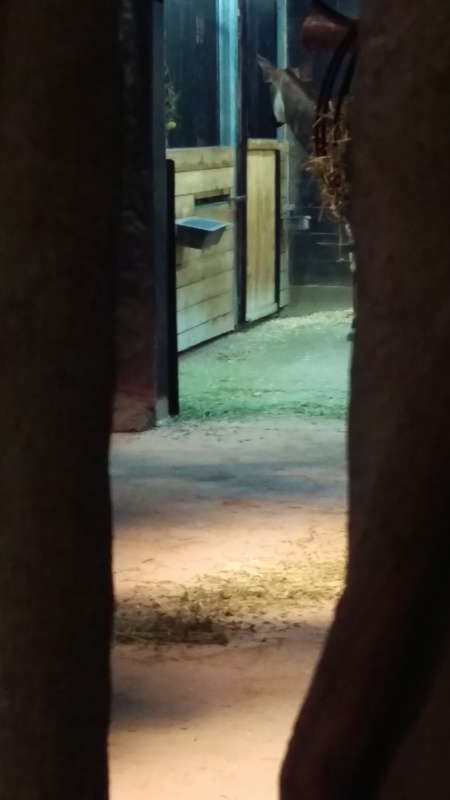 I did hear something hiss-like, but I thought it was a water system in another enclosure. 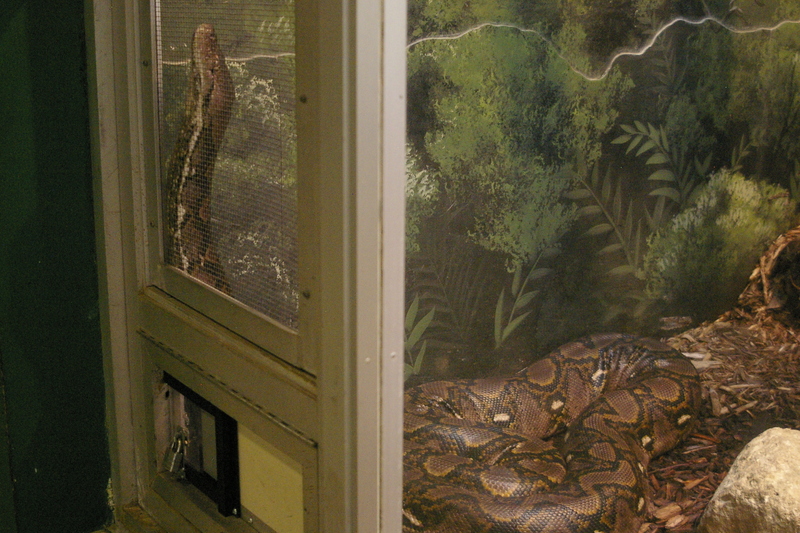 Michael was puzzled too, and watched the retic for a few moments. Then he slowly extended his hand. They had a long moment of some kind of interaction I didn’t understand. Michael moved very slowly, and the snake just watched him. 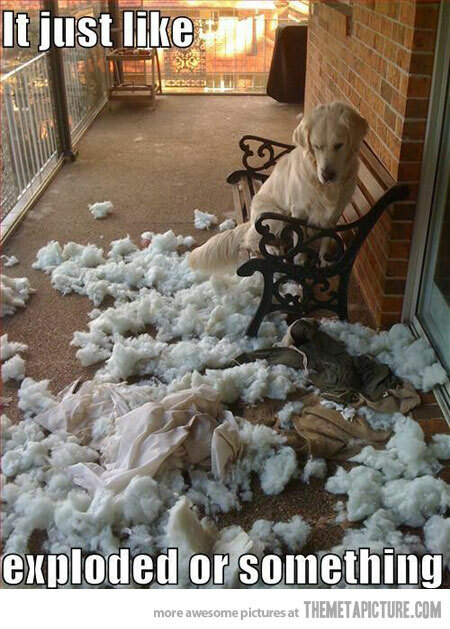 Or at least, I assume he did. One of the problems I have with understanding their body language is they don’t have eyelids, so they can’t close their eyes. One cannot tell, or at least I can’t, if the snake is awake or asleep or what. He never opened his mouth to hiss, which I assumed he would (too many monster movies with really pissed off snakes); Michael said the small triangular black spot between his lower lip and upper lip is an opening through which they can hiss; he said that’s what he heard. He said the hiss sound was intermittent, though, not continuous, so he can’t tell if that means I angered the snake or not. Before we left, I took this one just to show how big he is. Michael and I talked it over when we left, because I still don’t understand what happened or what the interaction meant. It bothers me that I didn’t hear him hiss, because I don’t want to irritate him or something. Michael said snakes have a very good memory, and it’s likely he will remember me now. After I got over the initial shock of that, I’m curious to go back and see what that means. Will he come over to see me again? Did I make him mad? Did he think I was there to feed him? Michael pointed out that the screen thing was probably the food slot (you can see the padlock and sliding opening below left in the picture). I was scared the whole time, but I can’t help but feel … I’m not sure the word. Honored, maybe? Something. I feel honored that this huge animal came over to … what, talk? … to me. I wouldn’t have believed it if I didn’t take the pictures to show myself what happened. Remember, no post tomorrow for Sunday. We resume the challenge on Monday with the letter “O”. This is one of my favorite new-to-me animals, one that wasn’t discovered until comparatively recently because they are so shy. Stay tuned! We updated the theme on my websites to fix some problems, but in the process it overwrote the widgets (the stuff I have on the right sidebar, over there >>>) and did some other odd things, so we’re fixifying it. AND, I loaded a new books page but did something goofy, which Dayna fixed yesterday; I just haven’t had time to finish setting it all up. 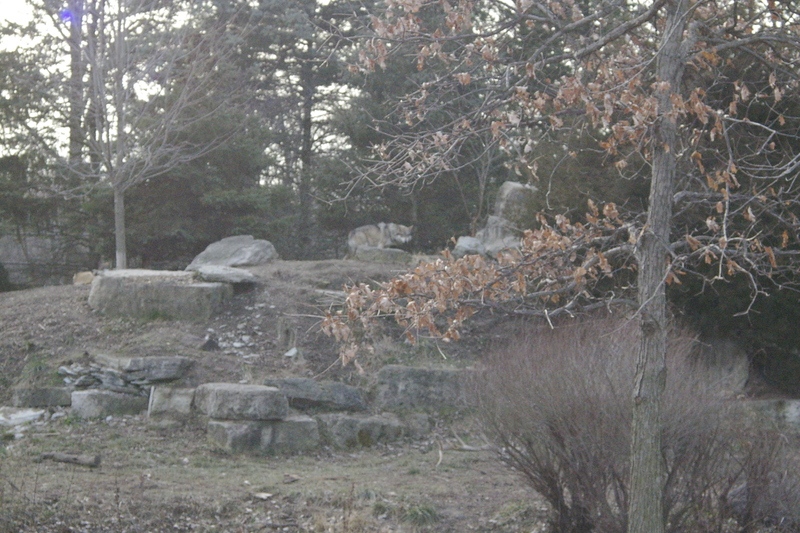 The habitat is large and affords the wolves much privacy; the downside is they’re not always available for photographing. 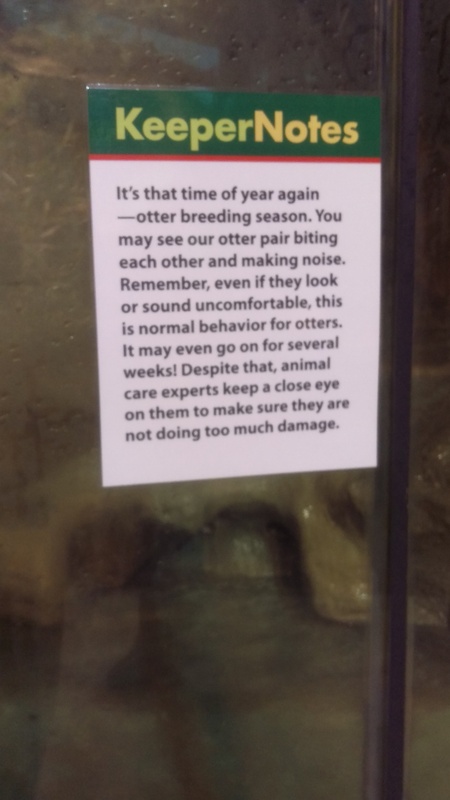 We lucked out on one of our visits, though. 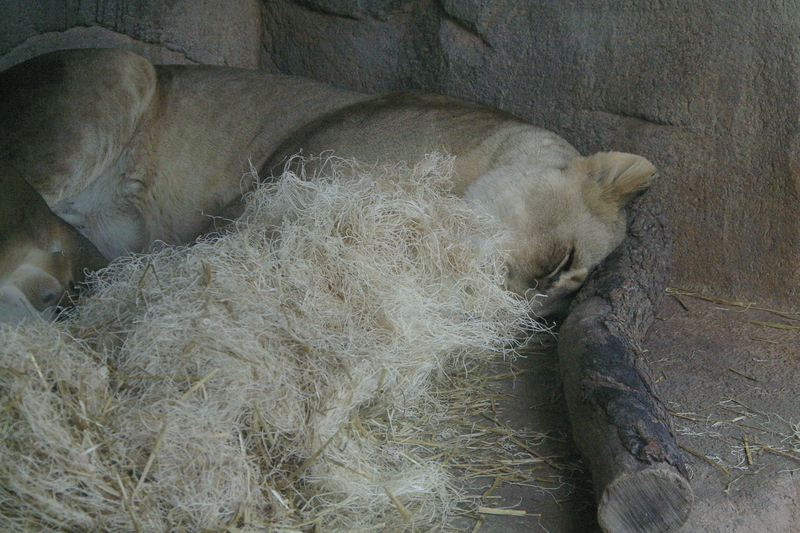 Nap time (in the very center of the image). 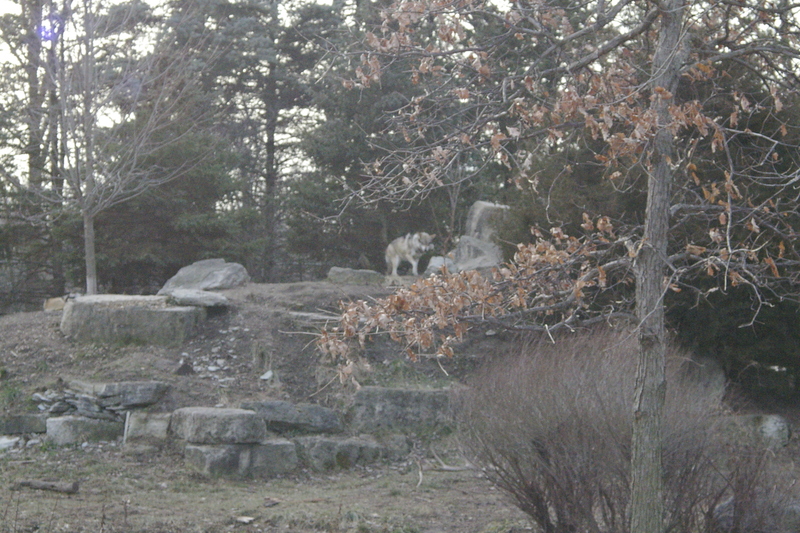 Again, from the Zoo: “Mexican gray wolves were considered extinct in the wild until their reintroduction into Arizona and New Mexico in 1998.” Brookfield successfully reintroduced the female they had to a wildlife park in New Mexico, and last year celebrated the birth of a litter of wolf cubs. They even held a naming contest on their website! This one is, admittedly, difficult to spot. 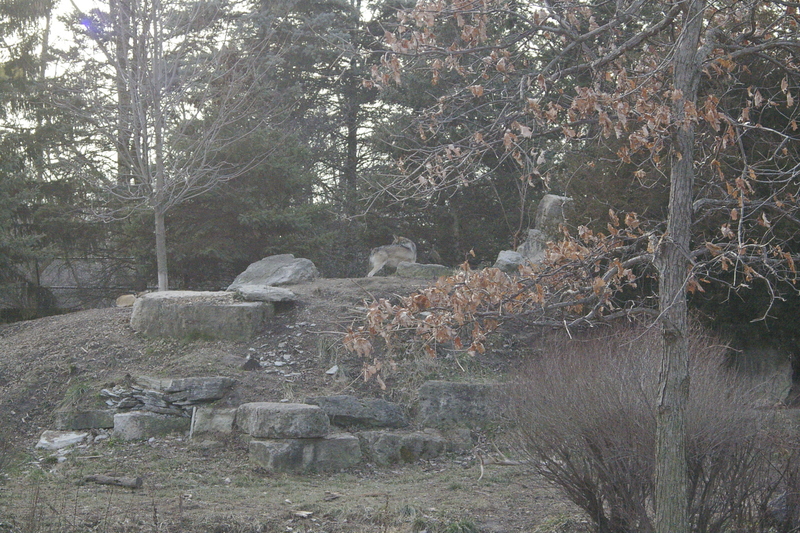 It’s the center knoll in their enclosure. If you see the smaller tree in the foreground, travel up along its trunk to where the branches first start on the right of the trunk. You’ll see the wolf centered in the branches. Wolves have a strict hierarchical structure. 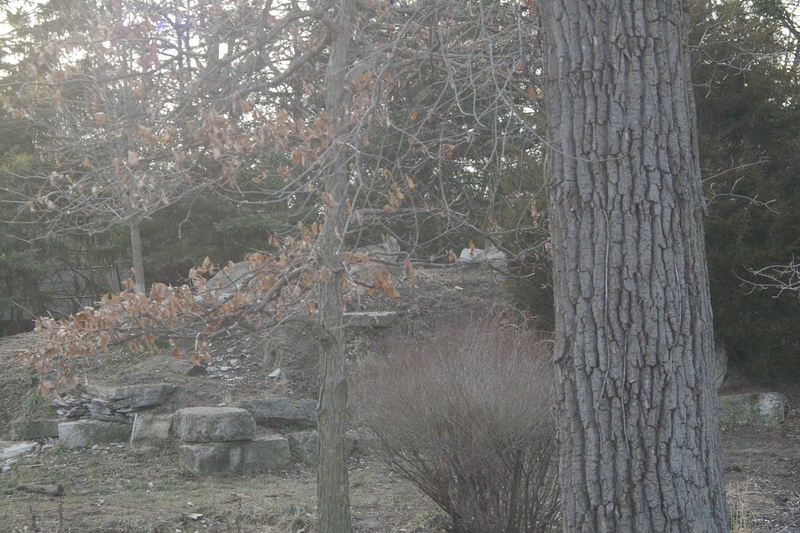 Whomever is at the highest point on the knoll is the alpha. 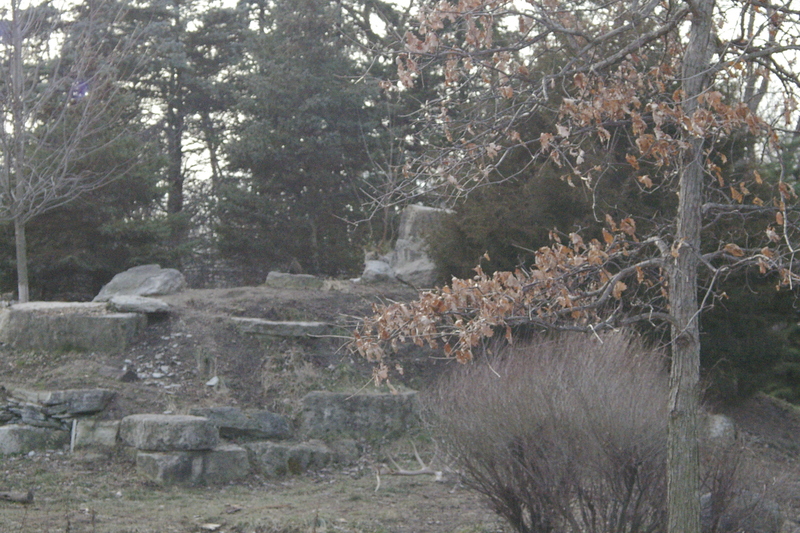 Another one arrives on the knoll for a nap. The other wolves show deference to the alpha pair by lowering their heads and not making direct eye contact. It’s fascinating to watch their body language as they move around. At first, it seems this one is hiding. 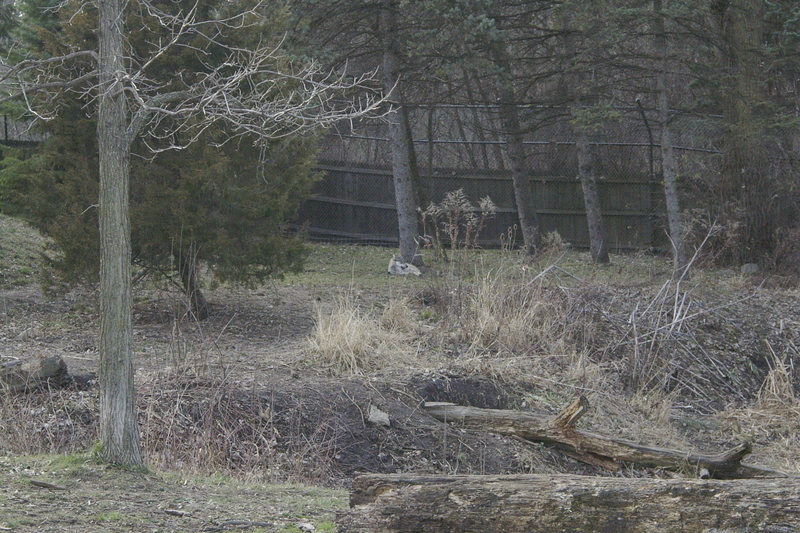 Then one realizes that it is, in fact, capable of seeing pretty much everything in the field of view – me and my husband photographing them by the fence, the front of their enclosure, the pedestrian path beyond that gate, all the way to the bald eagle. Check back tomorrow for the North American River Otter. Or… not? Stay tuned to find out! 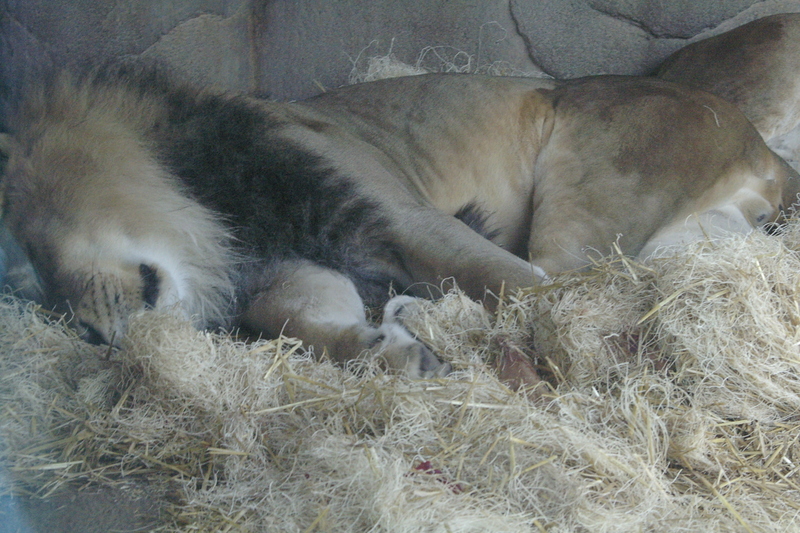 This ferocious young man is the pride of the zoo, the king of beasts, the lion of doom. Well, I added the, “of doom,” part. His wife, on the other hand, isn’t impressed. Snooze city. 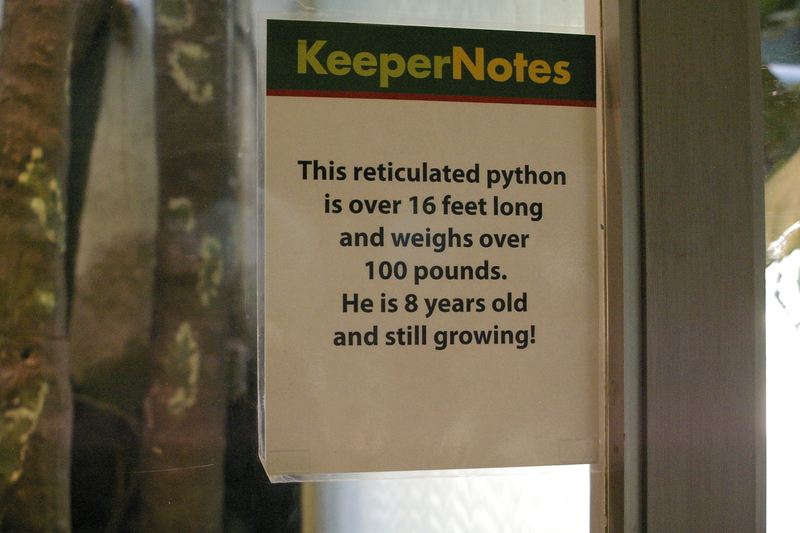 He’s actually not all that young, and he’s been at the zoo for a while. They are seriously threatened in the wild and Brookfield Zoo participates in an international Species Survival Plan to try and conserve these majestic creatures. 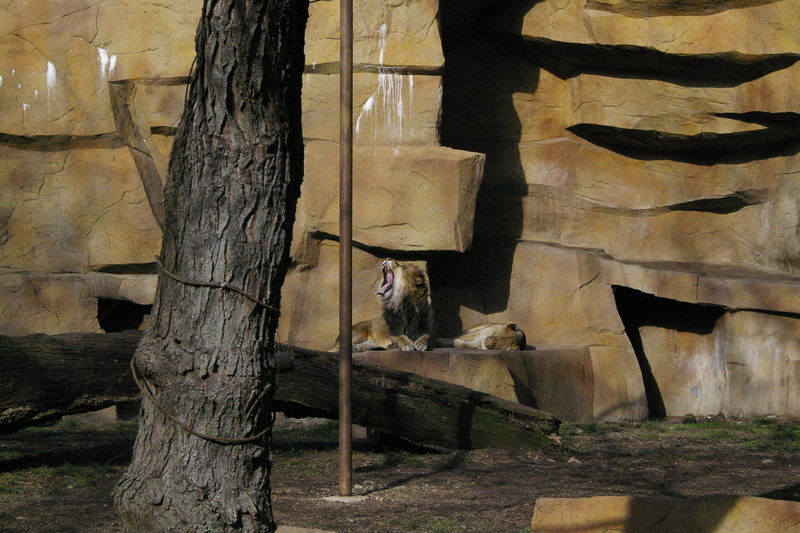 They are African lions, mostly nocturnal, though we did get to hear him roar one evening long about closing time. 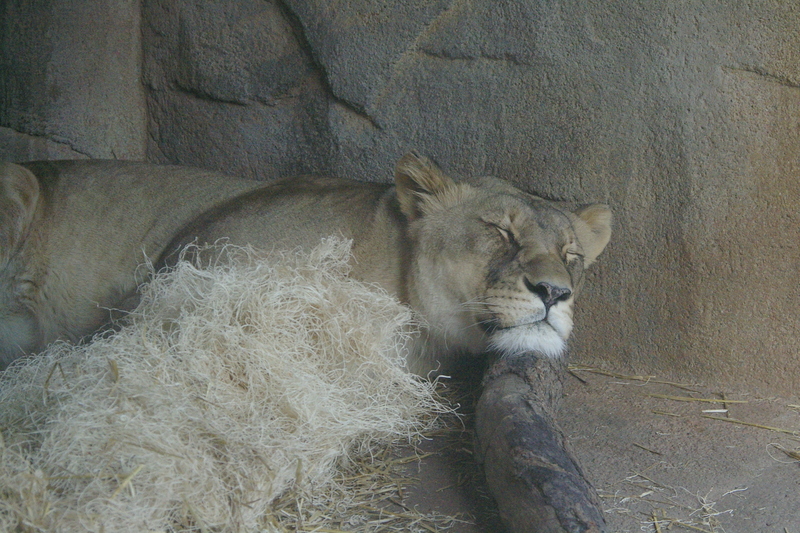 Lions spend about 20 hours a day asleep. Kind of like house cats, really. 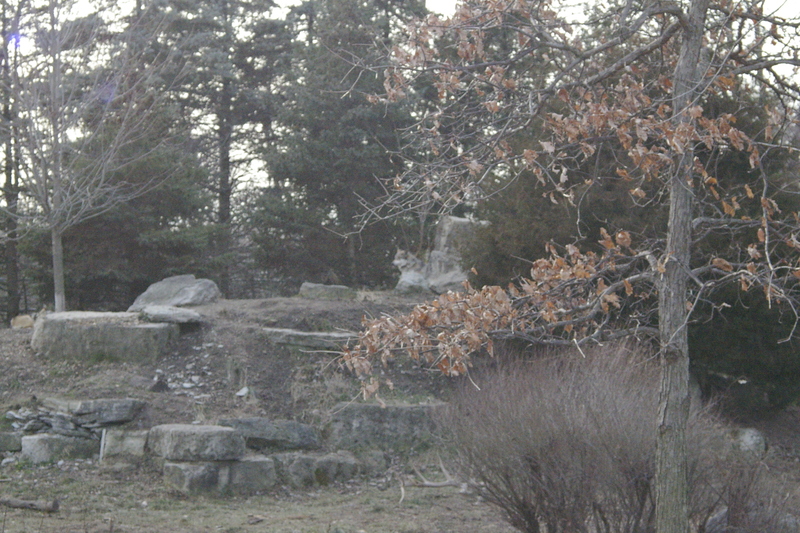 In fact, in the book Tribe of Tiger: Cats and Their Culture, by Elizabeth Marshall Thomas, biologists liken house cats’ behavior most closely with that of lions. Just makes you want to pet her, doesn’t she? 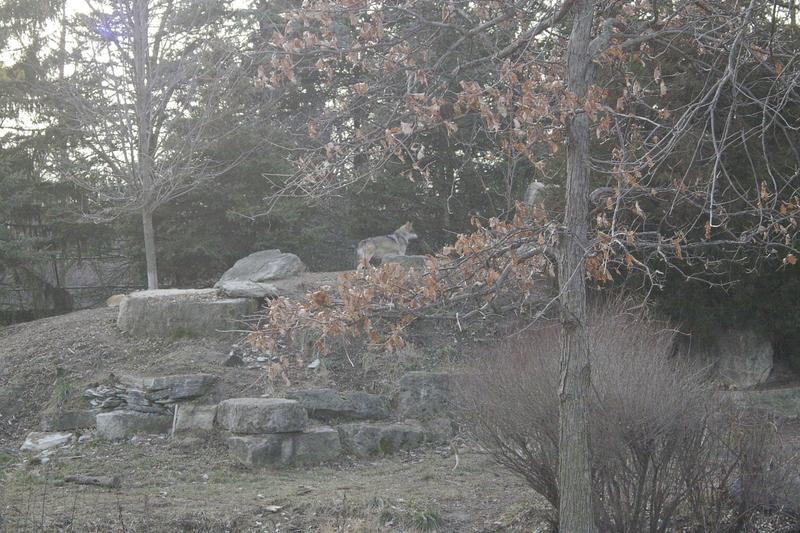 Tomorrow, we get to visit the Mexican Grey Wolves.